In 2013 TrasguTIC (formerly Trasgu WebTeam) presents TrasguGest, a set of management programs developed by our technical team and specially oriented to SMEs. TrasguGest was created to meet our Clients' demand to manage in a simple and direct way certain areas of their business or professional sector. These management tools are not intended to be the most complete on the market, but simple and concise tools that would adequately manage daily tasks within your business or professional activity. All TrasguGest products are developed in PHP, web-oriented programming language, so there is no need to install or configure anything on your company's computer systems, as access is performed by any web browser. Furthermore it can also be integrated into your website (or kept in parallel, if you prefer). 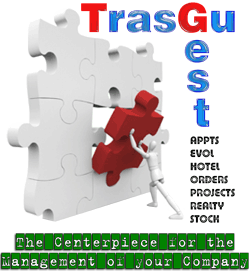 TrasguGest is constantly reviewed and updated, always meeting the demands and suggestions of its users. TrasguTIC also offers a fully functional demo of all TrasguGest products so you can evaluate the current version and provide feedback. If for your business or sector any TrasguGest program fully fits, let us know without any commitment. If it was impossible to upgrade one of the existing programs to meet your needs satisfactorily, TrasguTIC undertakes to study the development of a new program focused particularly on your requirements, either as a new TrasguGest product or as a tailor-made program.